As is our annual tradition, PJ and I spent a week in New York this past week. 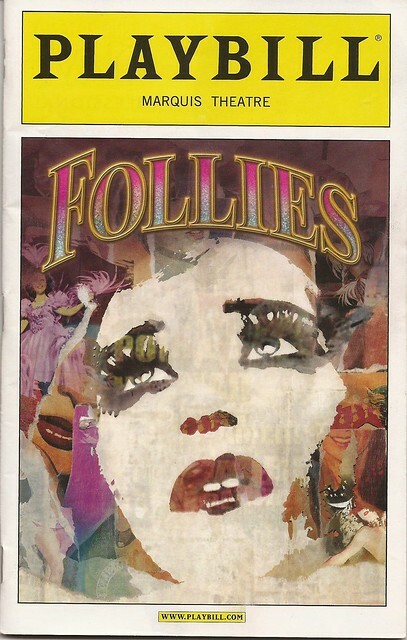 The first show we saw this year was the revival of Sondheim’s Follies, which is great! We saw Bernadette Peters in A Little Night Music last year, and so we couldn’t wait to see her in this show too. Follies takes place on the night before an old theater is being torn down to make room for a parking lot. To say goodbye to the old place, Mr. Weismann, the former producer of “Weismann’s Follies,” hosts a party in the theater for a group of his former performers. While the former “Weismann girls” remember days gone by, two couples become the focus of the show’s plot: Buddy and Sally Durant Plummer and Benjamin and Phyllis Rogers Stone. Sally and Phyllis were showgirls, and Buddy and Ben are the guys who courted and then married them. The “ghosts” of the past take the stage throughout the show, showing us this courtship and the couples’ interactions. It soon becomes clear that Sally, played by Peters, and Ben had an affair before their respective marriages and that Sally is still in love with Ben. But the show belongs to Peters and Maxwell, who both deserve Tonys for their work in this production. Follies is a surprisingly affecting musical that I really enjoyed. It’s closing next month, so I recommend seeing it before it’s gone!